For more than 80 years, the Shrine Guard have protected the Shrine. 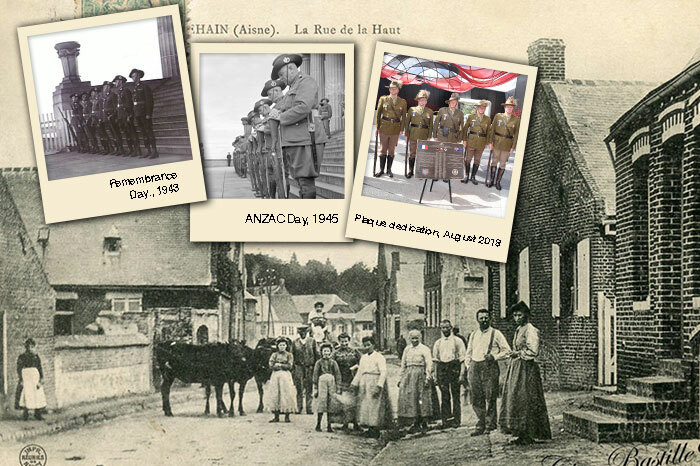 This month, members of the Shrine Guard will travel to France to honour their own who helped liberate the small village of Montbrehain 100 years earlier during the last Australian-led action of the First World War on the Western Front. 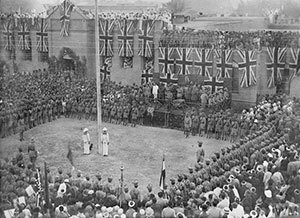 Among those valiant soldiers, drawn largely from Victoria, were original Shrine Guard’s Lieutenant George Mawby Ingram, VC, MM and Private George Blyth, MM—Ingram receiving the Victoria Cross for his bravery in the campaign. 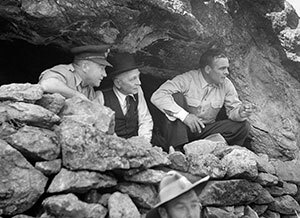 On 5 October, five serving Shrine Guard will be part of a ceremony for the official handover of a commemorative plaque signifying the bond that endures between our two nations. We welcome you to follow their journey with us on Facebook and invite you to delve into the history of the Shrine Guard in our image gallery. This service commemorates the date that the unit was raised, on 17 October 1940. Students from Christ Church Grammar will be in attendance, marking the 11th year of association with the 2/14 Field Regiment as part of the Adopt an Ex-Service Organisation program. 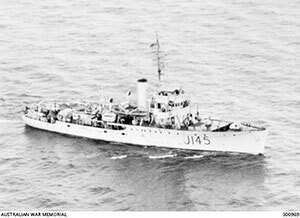 HMAS Lismore was a Bathurst Class minesweeper commissioned in 1941 and served during the Second World War and decommissioned in 1946. In October 2007 a plaque dedicated to HMAS Lismore was unveiled at the Shrine for the inaugural annual service held to honour those who served on her. The cessation of hostilities between the Ottoman Empire and the Allied powers took place at noon on 31 October 1918. 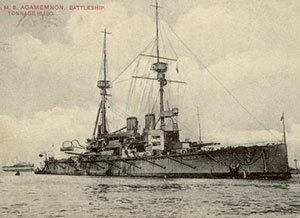 Negotiations and the signing of the armistice occurred aboard the Royal Navy warship HMS Agamemnon anchored in Mudros Bay, Lemnos. A special centenary talk will precede this service (full details below). Friends of the Shrine can attend public programs for free. General admission is $5 per person. Bookings essential. 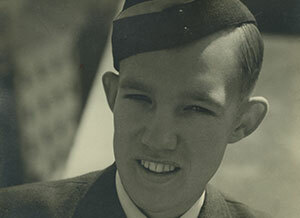 Join Melbourne author, actor and broadcaster Michael Veitch and discover the extraordinary story of young Australian airman Barney Greatrex. Shot down during his 20th mission over occupied France and rescued by the resistance, Barney seized the opportunity to continue fighting. 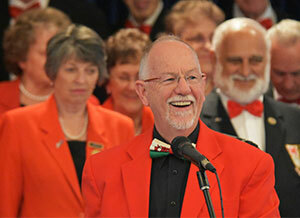 Enjoy a lunchtime performance by the Sydney Welsh Choir. This special concert in the lead up to the centenary of the Armistice of the First World War will feature wartime favourites, Welsh classics and songs of peace. Mark the centenary of the Armistice of Mudros with historian Jim Claven as he discusses the agreement which ended the fighting between the Allies and the Ottoman Empire across the eastern Mediterranean. This talk will be followed by a service in the Sanctuary. 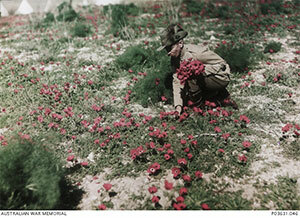 Meet the artists behind the special centenary of Armistice exhibition, Flowers of War. In conversation with the Shrine’s Director Access and Learning, Jean McAuslan, hear how this beautiful centenary of Armistice floral wreath project, comprising of hundreds of enamelled floral emblems, developed. Entry to exhibitions is by donation. All proceeds support the Shrine Education Program. 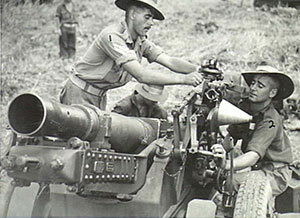 Many Australian service men and women gave aid to the resistance, other Australians owed their freedom and their lives to it. Uncover the stories of those who through accident or design found themselves battling the Axis using unconventional means. 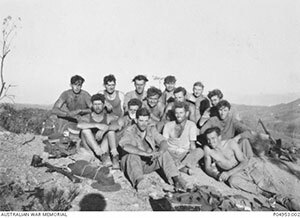 While Australian infantry served in the grim trenches of the Western Front, their comrades in the Australian Light Horse were fighting dynamic campaign of manoeuvre against the Ottoman Turks in the desert wastes of Sinai, Palestine and Syria. This is your last chance to see these historic and contemporary paintings, and memorabilia from the now legendary light horseman. We ship worldwide. All proceeds fund the development and delivery of our education programs. 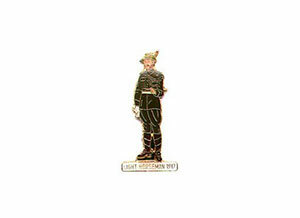 Shop our exclusive range of memorabilia commemorating our centenary of the Battle of Beersheba (2017) special exhibition, The Light Horse, closing this month. 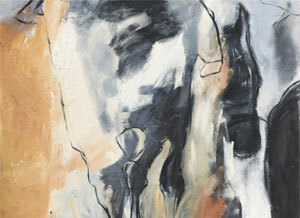 With items featuring artworks from the collection by Sidney Nolan and Susan McMinn, there is something in this special range of products for everyone. As the centenary of the Armistice of the First World War draws nearer, browse our extensive range of decorative poppy items including brooches, jewelry, scarves, t-shirts and caps to celebrate this special time. 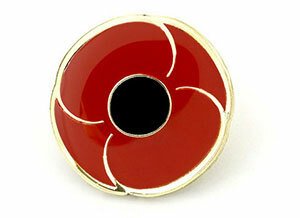 Purchase now to receive your order in time for the Remembrance Day Service on Sunday 11 November. 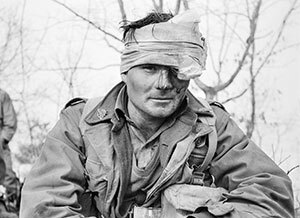 Remembrance conveys the legacy of Australia’s involvement in the First World War through a photographic exploration of 100 war memorials honouring ANZAC’s across the country and internationally. 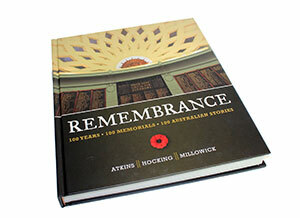 Providing historical information and photographs of the most architecturally stunning memorials dedicated to the Australian War effort, Remembrance also details 100 personal stories honouring the bravery of our ANZAC’s who made the ultimate sacrifice for our nation. 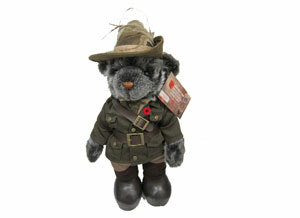 Limited edition bear ‘Constable T’ is smartly dressed in Shrine Guard uniform. He is dedicated to the past and present members of the Shrine Guard who play an important role in protecting Victoria’s iconic monument and the memories of those who have served, and continue to. Share the post "October 2018"